I was recently asked to contribute four German recipes to a publication whose topic would be international cuisine. It had to be a soup, an entree, a salad and a dessert. While desserts and entrees are fairly easy when it comes to German cuisine (think tons of eggs in sugar laden cakes or heavy meats with rich gravy), it took a bit more thought to come up with a typical soup and salad, as I wanted those two categories to fit into my ideas of healthy food. I went through all the dishes that we ate at family houses while on vacation back in the summer. Until my grandma's cucumber salad came to my mind. My grandma is 80 years old and has been living alone for most of her life. She loves children, and used to be a nursery teacher in the village nursery school before becoming a pensioner. She has got a big heart. One can feel that she has always been surrounded by children as noise and a little mess don't bug her at all. It is also inevitable that she has been living alone for very long. There is certain rules in her house that cannot be messed with. Like lunch time at 11.30am sharp. Whenever we go visit her on our summer vacation, she loves to have us over to have lunch with her. My husband and I usually skip breakfast on that day, as lunch at granny's house will be a 3-course meal with a light broth soup as a starter, some major meat roast with several sides and potato dumplings as main, and of course pudding. When we arrive just 10 minutes late, she will not say anything, but I can see that she has been waiting impatiently and that food was ready to be served for at least 15 minutes. Grandma's cucumber salad has been around for as long as I can remember. She would grow the cucumbers in her garden behind the house, a huge patch that has several apple and walnut trees, plum and pear trees, gooseberry and redcurrant bushes, and all sorts of vegetables from potatoes over carrots, green beans to savoy cabbage. 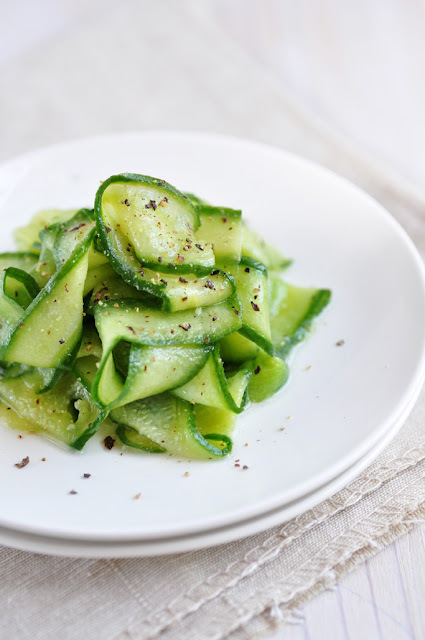 Grandma's cucumber salad is one of the most simple and most refreshing salads I know. It's perfect on hot summer days, or to lighten up a heavy meat-laden entree. Here is my German salad recipe for you. Enjoy! Thinly slice the cucumbers. Sprinkle with salt and let stand for about 30 minutes. Squeeze them gently to get rid of excess water. Transfer to serving bowl. Combine the white vinegar, oil and sugar. Mix into cucumbers and adjust seasoning, e.g add more sugar if the vinegar is too dominant. Top with freshly ground pepper. This salad is especially refreshing when cooled in the refrigerator for 1-2 hours before serving.